OP0279. 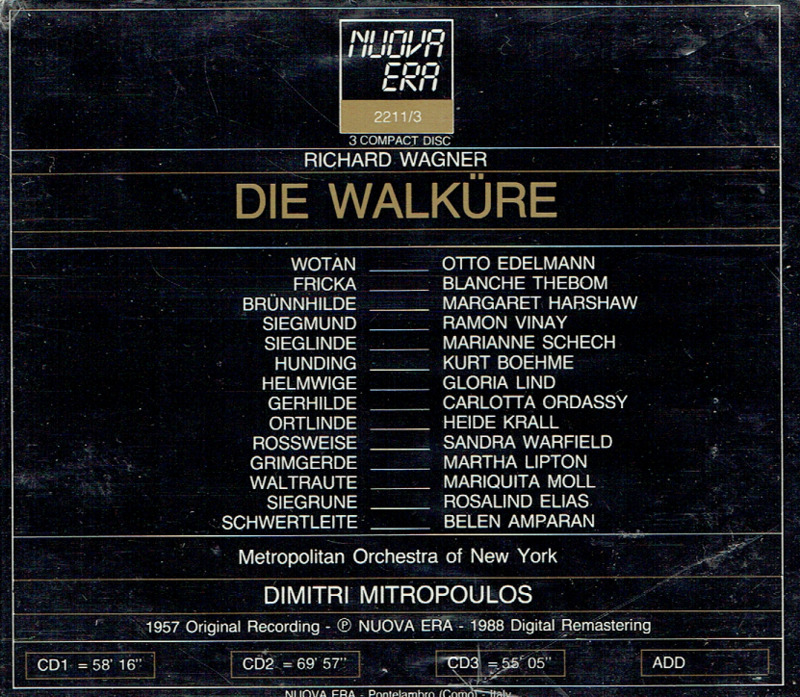 DIE WALKÃœRE, Live Performance, 2 Feb., 1957, w.Mitropoulos Cond. 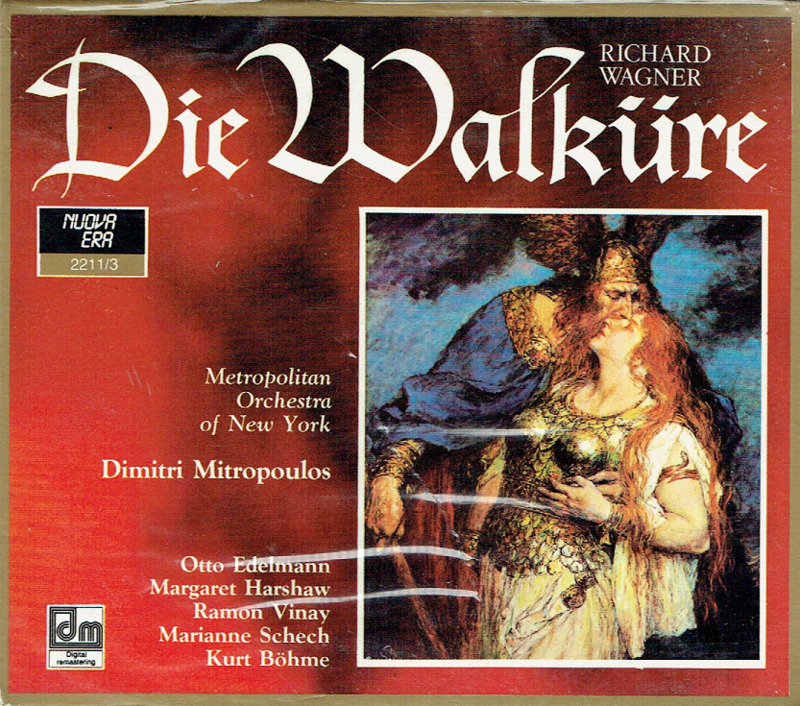 Met Opera Ensemble; Otto Edelmann, Margaret Harshaw, Ramon Vinay, Marianne Schech, Blanche Thebom, Kurt Bohme, etc. (Italy) 3-Nuova Era 2211/13, w.libretto. Very long out of-print, Final Rare Sealed Copy! 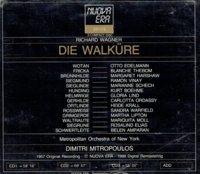 "Otto Edelmann, a leading Austrian bass-baritone of the postwar period particularly known for his interpretations of Wagner and Strauss roles, had a long association with the Vienna State Opera, where he sang for 30 years, and also had a close relationship with the Metropolitan Opera, where he made his debut in 1954 as Hans Sachs in Wagner's DIE MEISTERSINGER and sang until April 1976. His final Met role was Baron Ochs in Strauss' DER ROSENKAVALIER, one of his signature roles, which he first performed in 1952 at La Scala with Elisabeth Schwarzkopf and Herbert von Karajan. That performance is still available as an audio recording; there is also a video of a Salzburg production with the same principals. Born in Brunn am Gebirge, Austria, in 1917, Mr. Edelmann studied in Vienna with Theodor Lierhammer and Gunnar Graarud and had his first engagement in Mozart's LE NOZZE DI FIGARO in Gera, Germany, at the age of 20. He was subsequently engaged as a company bass in Nuremberg, where he sang his first Waldner in ARABELLA under the baton of the opera's composer, Richard Strauss. In World War II he was conscripted into the German army and spent two years as a Soviet prisoner of war before returning to the stage in 1947, first in Graz, Austria, and soon thereafter with the company of the Vienna State Opera, with whom he made his debut as the Hermit in Weber's DER FREISCHÃœTZ. A FALSTAFF in 1950 under Clemens Krauss, followed by appearances in the first postwar Bayreuth festival as Hans Sachs and in the Beethoven Ninth under Wilhelm FurtwÃ¤ngler, sealed Mr. Edelmann's status as a leading bass-baritone of his day. While his European career included Italian roles like Verdi's Falstaff and King Philip in DON CARLOS, and French ones like MÃ©phistophÃ¨les in Gounod's FAUST, the Met kept him to the German repertory, presenting him as Sachs, Wotan, King Marke and, of course, Baron Ochs. As Ochs, he also opened the rebuilt Festspielhaus in Salzburg in 1960. In December 1976 Mr. Edelmann sang his last performance, a final Waldner in Vienna, and turned to teaching at the Vienna Music Academy." "Margaret Harshaw, an American soprano and mezzo-soprano who was best known as a Wagnerian singer but whose performances in Mozart and Verdi operas were also highly regarded, sang at the Metropolitan Opera for 22 seasons, from November 1942, when she made her debut as the Second Norn in DIE GOTTERDAMMERUNG until March 1964, when she gave her final performance as Ortud in LOHENGRIN. Because she spent the first nine years of her Met career as a mezzo-soprano and then switched to soprano roles, she sang more Wagner roles than any other singer in the Met's history. These include 14 roles in the RING operas, in which she began as a Rhinemaiden and eventually sang all three Brunnhildes, as well as both Senta and Mary (in the same season) in DIE FLIEGENDE HOLLANDER, Isolde in TRISTAN UND ISOLDE, Magdalene in DIE MEISTERSINGER, Kundry in PARSIFAL and Elisabeth and Venus in TANNHAUSER. In 1962, Miss Harshaw became a professor of voice at Indiana University, where she taught until 1993." "Marianne Schech debuted at Coblenz 1937 (Marta in TIEFLAND). From 1937 to 1945 she sang in Münster, Munich, Düsseldorf and Dresden. Schech was a member of Bavarian State Opera, Munich, 1945-70, specializing in Wagner and Strauss roles. Her Covent Garden debut was in 1956, followed by her Met Opera debut 1957. Schech debuted in San Francisco in 1959. She was one of singers of trio from DER ROSENKAVALIER at Richard Strauss' funeral, 1949.